Simply join Audible using this link for the Turning book or one below for any of our other books. Don’t know what Audible is? It’s Amazon’s audio book subscription service. The first month is free. After that, it’s $14.95, which includes a free audio book every month and additional discounts. There’s no contract and they have an easy-to-cancel policy. When you select one of the Horse Sense and Cents® titles as your first choice, we get a “bounty” if you remain a member for 61 days. With this little bit of help you provide, we can continue to publish free content on HorseSenseAndCents.com. We’ve been here for horse lovers for more than a decade. Visitors continue to pose questions on posts created years ago – and get timely answers. Already have the Turning book or are looking for something different? Below are our 11 current Horse Sense and Cents® audio titles. These range from training tips for a variety of horse personalities to unusual equine job descriptions and success story secrets. Find one you love using the hyperlinks below. Please note, book lengths vary. The Turning book is a full length book with about five hours of listening time. 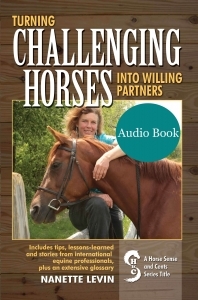 The Inventing Your Horse Career & 5 Easy Ideas titles are about one hour long. The Alpha, OTTB and First Off the Property Ride titles are about 1/2 hour in length. The above link is for US customers. Click here if you’re in the UK. Here’s the link for France. For customers in Germany, please click here.